We have 3 events in April, 2 at Road Atlanta and 1 at VIR. I hope you can join us. We have some special elements for each one. Simcraft will have one of their world class simulators on hand and we will provide virtual coaching while you drive it, all complimentary of Simcraft and DMTD. When you can’t get on the track, train with the most realistic racing simulator from SimCraft. SimCraft's proprietary motion technology is the choice of many professional drivers and teams, and is endorsed by NASCAR, IMSA and IndyCar drivers. The full motion motorsport simulator from SimCraft features the stiffest and most advanced chassis design with the highest fidelity motion technology for motorsport training. Precedes the HSR Mitty race. We have a lot coming up. 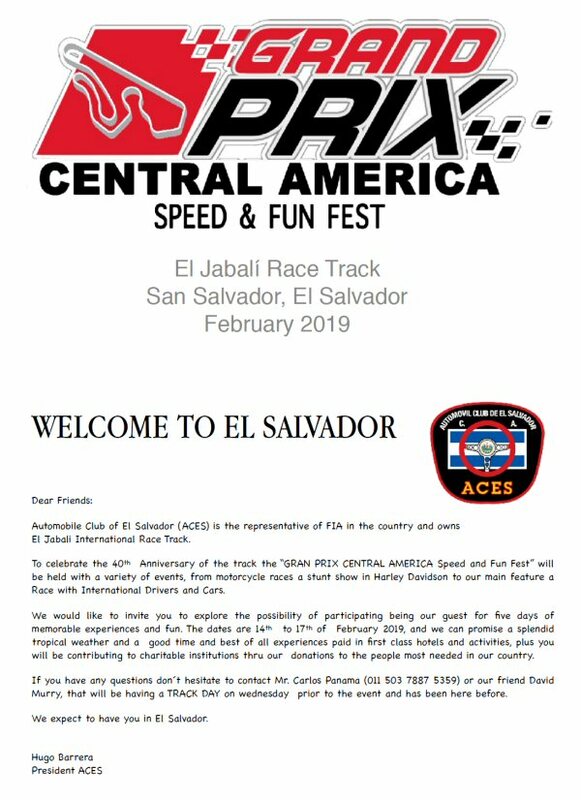 One event in March at Sebring with two options and three events in April at Road Atlanta and VIR. 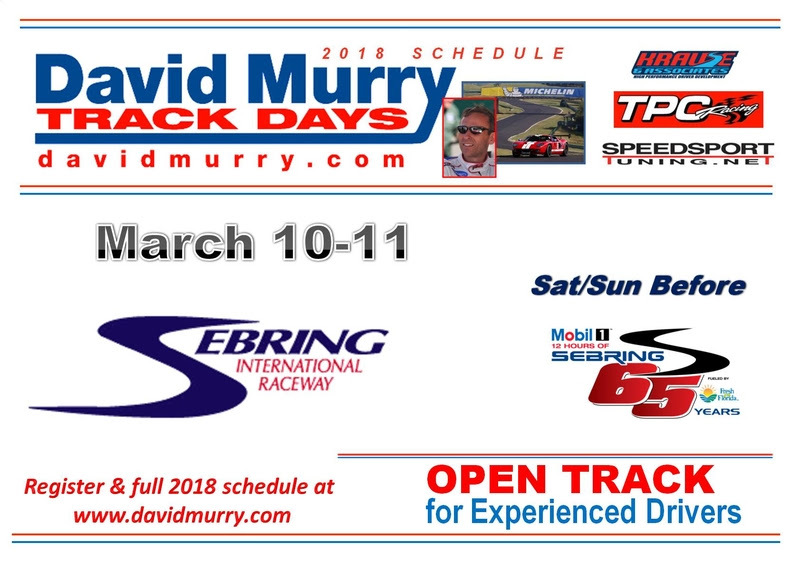 Next DMTD event, Sebring March 10-11 weather forecast is perfect. Just over a week away. Two options available, click to view and register. 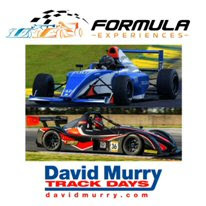 David Murry Motorsports and Formula Experiences have forged a new relationship that provide drivers and their guests the ability to experience the raw intensity of driving or riding along in two-seater prototype race car or driving a single seater Formula cars. 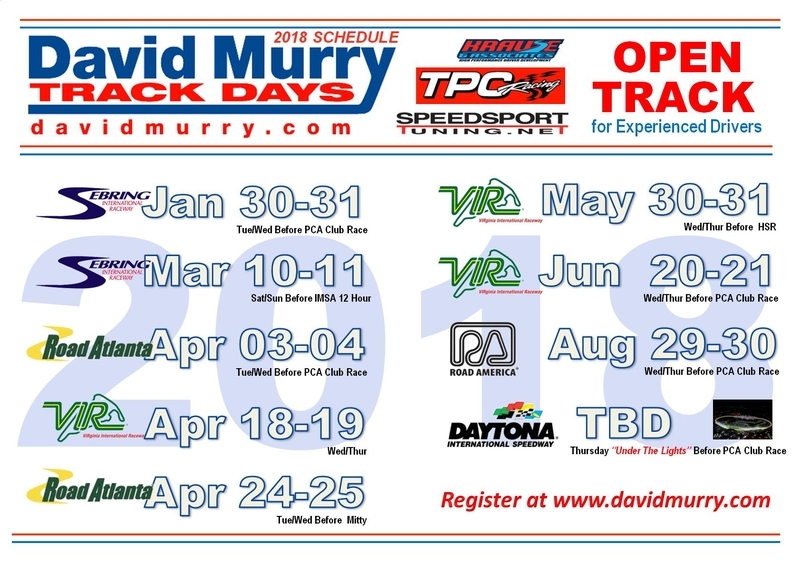 At David Murry track days at VIR, Formula Experiences will have cars available for à la carte options, including driving sessions in both new 2018 Formula and Prototype cars and thrilling ride alongs in Radical SR3’s. Rides will be available by day or, in limited quantity, through the darkness of night! You can purchase Ride Alongs or Driving sessions directly from the Formula Experiences website on the Track Days page or call Heather at 919-741-7151. 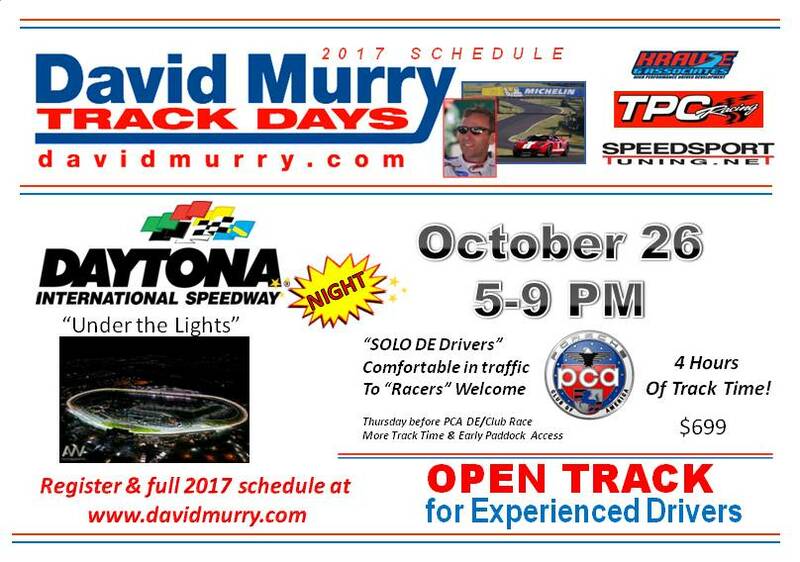 We are going back to Sebring, Saturday/Sunday, March 10-11 for our next DMTD event. It is the weekend leading into the IMSA 12 Hours of Sebring Race. I hope to see you there, please let me know if you have any questions. Thanks. 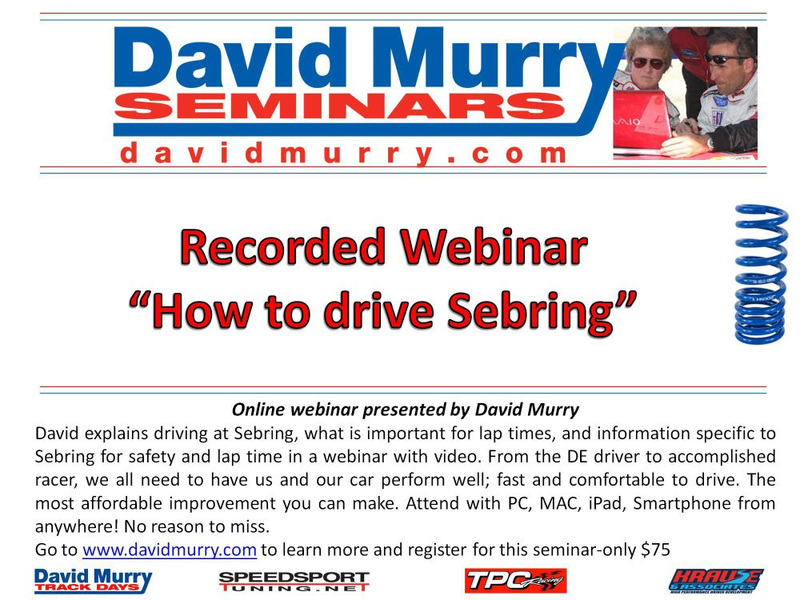 Planning to drive Sebring? Get a head start and learn the details on driving it. Be prepared when you get there and go back and review the webinar anytime as often as you like. 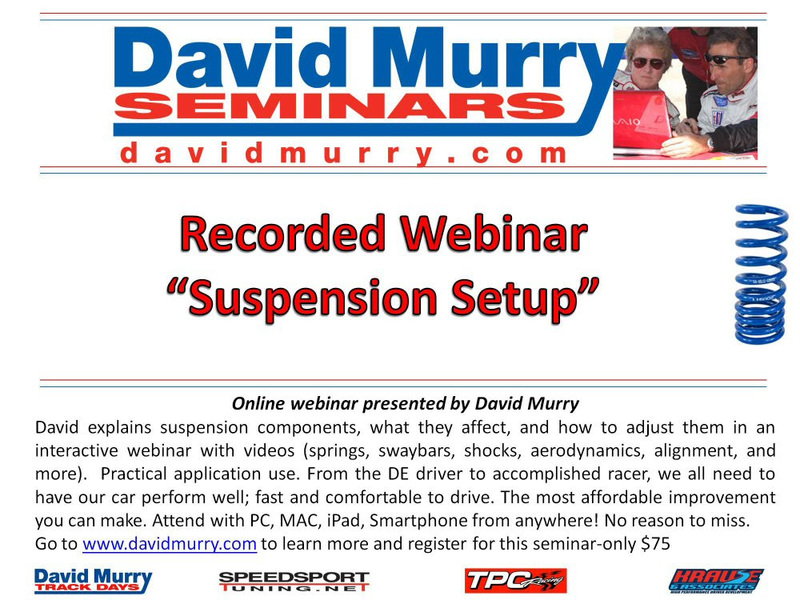 Also, learn setup changes that make your car faster and easier to drive. Register for online webinars for theses and others. 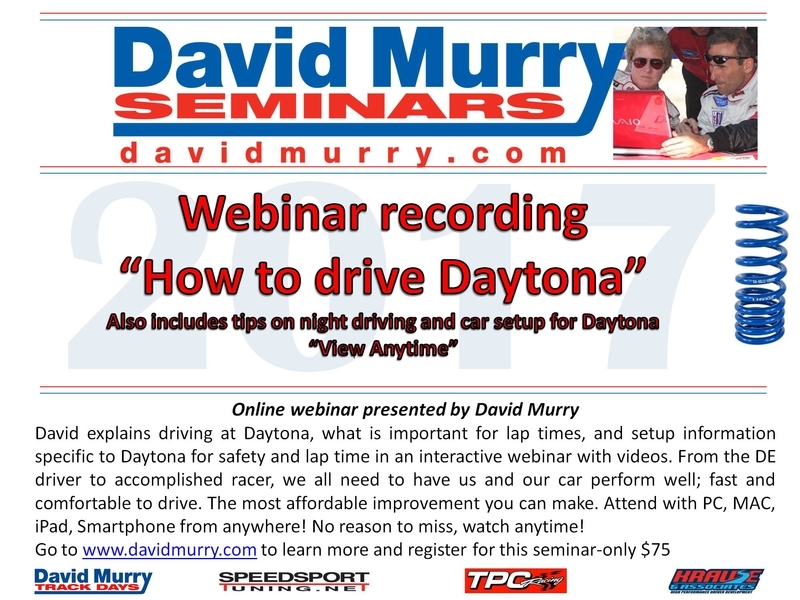 Go to www.davidmurry.com to learn more and register. I hope the new year brings good things to you with another great year! 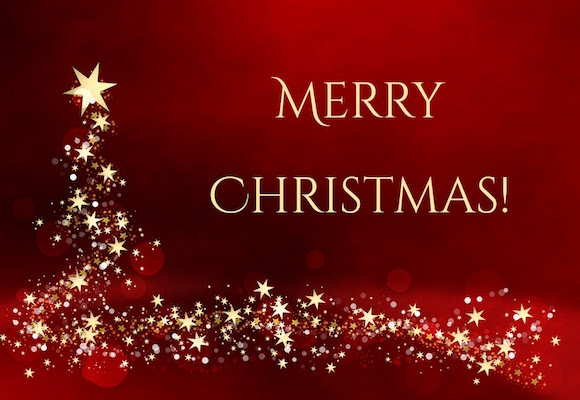 Mark and I wish you Merry Christmas and Happy New Year. We hope your holidays are great. AMMO does video explaining what DMTD is and does.